You know what’s really hard? Perseverance. Making a mistake and trying again. Sticking with something for years instead of moving on to the next thing. Failing over and over, and still keeping the faith that you’ll eventually succeed. You know who has a lot of practice with perseverance? Musicians. You know what’s really hard? Knowing how to approach a difficult task. Making a plan of attack. Knowing how to break big and difficult things into smaller, more manageable pieces. Following through. Not getting so overwhelmed by the sheer cope of a task that you talk yourself out of ever starting. You know who has a lot of practice with knowing how to approach a difficult task? Musicians. Having the courage to approach someone you don’t know, or stand on stage in front of dozens or hundreds of people. Being able to calm your mind and focus despite your nerves. You know who has a lot of practice with putting themselves out there, in a public and nerve-wracking way? Musicians. You know what’s really hard? Developing healthy habits. Do you want to exercise every day? Maybe hydrate more. Or maybe it’s spending a few minutes a day learning a foreign language on Duolingo. Maybe you want to develop the habit of reading every day, journaling every morning, or doing the dishes every night without fail. You know you need habits. You know you need routines. But sticking to them in the long term is much harder than it sounds. You know who has a lot of practice with sticking to a good habit, every single day, for the long term? Musicians. 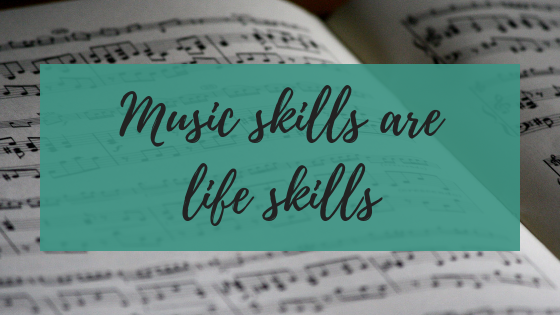 Music skills are life skills. And when you practice music, you are really practicing so much more than music.